One of the frequently advised planting patterns for an orchard is based on a quincunx pattern as shown right. Here the four outside trees are at 24 unit spacing and, as the pattern is based on an isosceles right triangle, the distance between rows is 12 units and the distance a is about 17 [square root of (122 + (122)] or square root of 288, which rounds to 16.97. 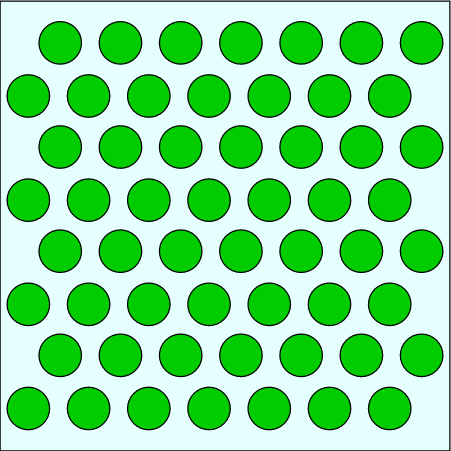 The problem with planting in a quincunx pattern is that the quincunx is a pattern of 5 units and only 5 units. When you add more units the pattern degrades into a rectangular grid! Thr drawing below is such, made of the quincumx shown. It is in clearly a rectangular grid on a 17x17 spacing, simply turned at 45 degrees. The space below holds 50 trees. 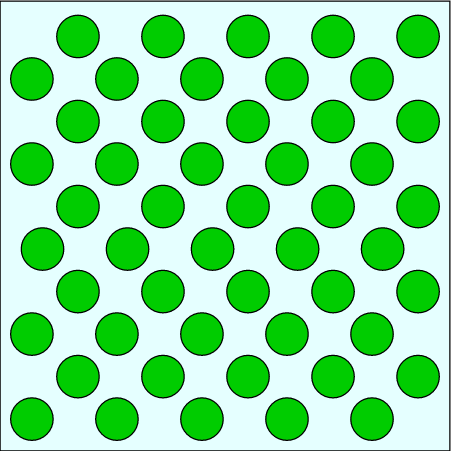 A better pattern is the hexagonal pattern as shown right. 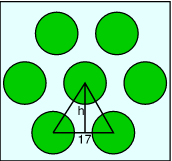 This is based on an equilateral triangle rather than an isosceles one, so the sides are all 17 unit spacing and h is about 14.7. As you can see below, the in the same area you now get 56 trees in the same space instead of 50 and spacing between trees is absolutely uniform. The down side of the hexagonal pattern may be that it is a little more difficult to calculate! Page first published Last updated Saturday 23rd March 2019. © 2019 - 2019 Richard Torrens.